Around 400,000 people marched through Manhattan [on September 21] to send a message to world leaders regarding the dire consequences of climate change, and the urgent, desperate necessity of enacting sweeping reforms to stop it. 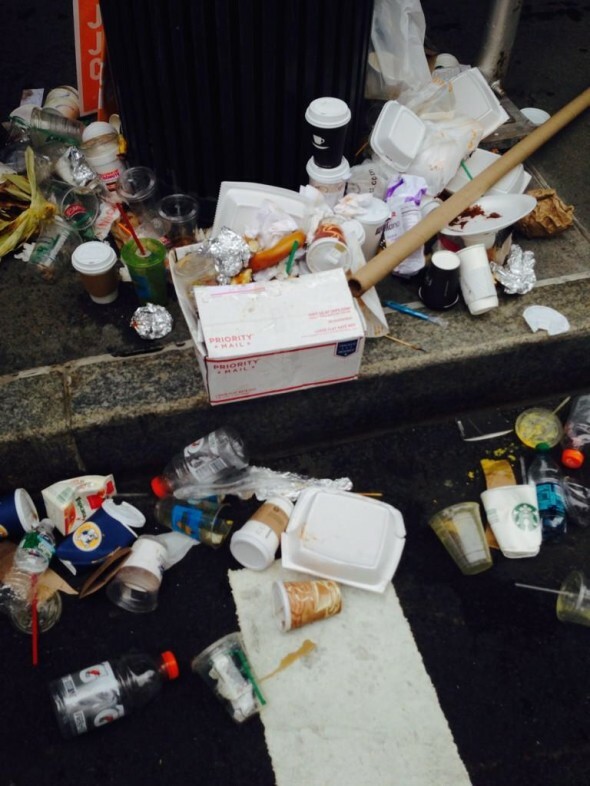 It appears at least 150,000 of those people tossed away their paper Starbucks cups. 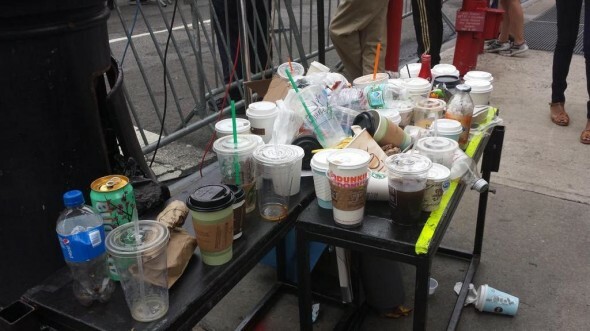 From the looks of it, much of what was heaved onto the ground by activists caught up in the fervor wasn’t trash at all—a healthy amount of the detritus piled in the gutters was recyclable, indicating that attendees couldn’t even be bothered to stuff their spent Gatorade bottles into their bags until they located the appropriate receptacle. (Which, to be clear, is a recycling bin.) Also, the coffee cups! 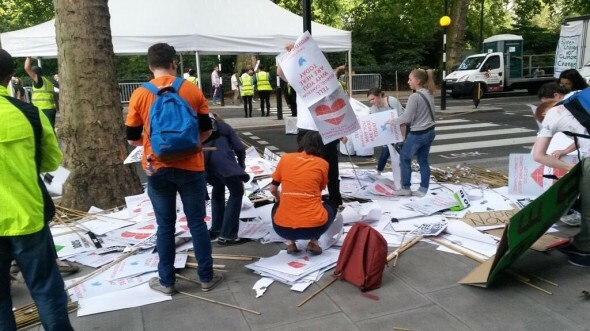 …It’s a grim day when some of the city’s most dedicated activists are blind to the impact of their own habits. Coffee cups are generally coated with plastic, which makes them neither recyclable nor compostable. Plastic cups and cans are recyclable, and letting them simply fall from your hand when you’re done with them is not an acceptable means of disposal. Paper and cardboard make up over 40 percent of the solid waste sent to die in North American landfills. The square-footage of natural habitat lost making a 16-ounce paper cup with a sleeve is estimated to be .93 square-feet. In 2006, more than 6.5 million trees were cut down to make 16 billion coffee-specific paper cups for U.S. consumers, resulting in 253 million pounds of waste. Reusable coffee cups are cheap—Starbucks sells their version for $1. Stuffing it into your backpack, purse or murse can be a pain, but any additional back problems wrought from carrying an empty mug or bottle will be nothing compared to the back pain you’ll feel when you’re forced to spend the rest of your life treading water (as will happen if Al Gore’s dire predictions come true). In a modern-day reinvention of Phileas Fogg’s expedition around the world in 80 days, three Norwegian friends have set a new world record by visiting 19 different countries in a single day. Using a combination of hire cars and scheduled flights, Gunnar Garfors, Øyvind Djupvik and Tay-yong Pak followed a winding, elaborate route across Europe to take in as many countries as possible. Starting in Greece just after midnight, they travelled as far as the Netherlands before looping back to Liechtenstein with just 20 minutes to spare. True to the spirit of Jules Verne, the journey was not without its mishaps and adventures. The queue at the border crossing to Kosovo was so long that the three had to abandon their car and sprint across and back, just so they could say they’d set foot there. And unknown to the team, their cameraman managed to get himself briefly arrested in Greece for filming illegally at the border with Bulgaria. After all their exertions, you could excuse the trio for feeling a little weary. But Mr. Garfors told the Telegraph it was just “a bit of a road trip, if you like”. “You could call it the ultimate boys’ trip, three lads visiting all these countries and having a bit of fun,” he said, speaking from Zurich on his way home. 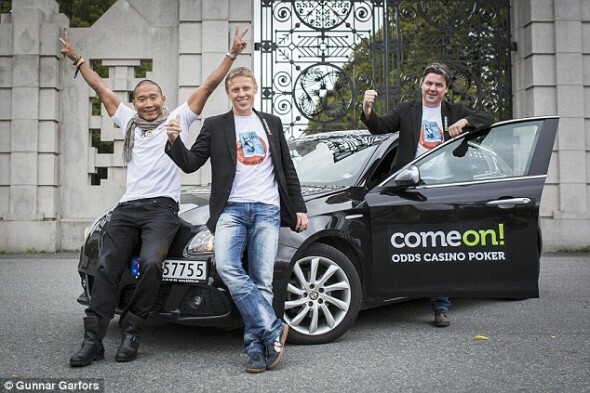 What had started as a private challenge became something of an expedition when a Norwegian bookmaker started taking bets on whether the trio would make it, and which country they’d visit next. The friends had previously tried to break the record in May, but ended up only matching the previous best of 17 countries. This time they researched the route in advance, and left hire cars waiting at airports along the way. Mr. Djupvikgrunnen did all the driving, and Mr. Garfors took care of planning the route and map-reading, while Mr. Pak kept them supplied with sandwiches and energy drinks. They used refuelling stops to dash to the loo. But even careful planning couldn’t allow for everything. They arrived in Macedonia to find the car they’d booked had been rented to some one else, and they had to make do with a run-down Ford Focus with 100,000km on the clock. “I think I’ve broken my neck driving that car,” said Mr. Djupvikgrunnen. From Gothamist and London’s Daily Telegraph.